Microgaming slots are still considered the best in the world, as they are currently one of the most popular software development companies that focus on the online casino industry. 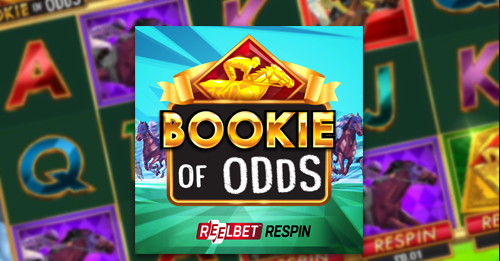 Their portfolio is continually being updated with fresh and interesting titles, and their latest addition to the portfolio is called Bookie of Odds. The game was developed by a company called Triple Edge Studios, and it is made exclusively for Microgaming. The slot’s name obviously suggests that this slot has to do something with sports betting — or horse betting to be precise. Its logo is a jockey riding a horse which is a perfect way to attract lovers of horse races and betting to start playing online video slots. The game includes a couple of interesting features such as bonus spins, scatters, wilds, and an exciting new feature called REELBET feature. Let’s examine it a little closer! There are a couple of great features that make Bookie of Odds stand out and provide hundreds of hours of entertainment slot lovers. First of all, the Scatter and the Wild are actually incorporated into one symbol that replaces other symbols on the reels and activates bonus spins if you land three or more of them. You can trigger up to 25 free spins if you are lucky enough. This special symbol will also stretch during the bonus game, which will help you boost your potential prizes during this part of the game. The best thing is that you can re-activate bonus spins and increase your chances of winning valuable cash prizes. Most of the symbols which are present on the reels are connected to horse races in one way or another, which makes this game an ultimate experience not only for those who love to place bets but also for people like horses. Brendan Walton is the Design Lead at Triple Edge Studios, and he stated in an official press release [https://www.microgaming.co.uk/News/Microgaming-storms-out-of-the-gates-with-Bookie-of-Odds] by Microgaming that they were delighted to introduce the brand new slot called Bookie of Odds, which was a feature-packed game that celebrated horse races. He added that the game was enchanted with vibrant graphics as well as the “heady” atmosphere which was usually present during horse races. Furthermore, he stated that all of that is crowned with the REELBET re-spin mechanic as well as the free spins which could help players win up 5,000 times of the initial bet placed before the bonus round had begun. Microgaming is always busy, and apart from being super-productive in terms of launching new games, they also did an outstanding job when it comes to creating new content supply deals one of the most recent deals being inked with Wazdan. In other words, Wazdan will supply the company with content which will be distributed to Microgaming’s customer base.